“Full Breach,” Book One in the Blue Warp Series by N. Lawrence Mann, is a unique suspense novel that captures all the great elements of a mystery that will keep you guessing what is truth and what is fiction. Brennan Reynolds is a songwriter whose addiction has gotten the best of him. Experiencing severe headaches, hallucinations and tormented dreams, he soon finds himself a suspect in a murder investigation. His troubles escalate when he encounters a runway from a cult, both fearing for their lives. Beth, the escapee from the cult, is being hunted down by the use of a tracking device implanted in her wrist. An unknown masked man is tracking down so called “prophets” and forcing them to prove what they profess is true. The question is will Brennan’s addiction end his life? “Full Breach” was not what I expected; it was more. Mann brings readers into the world of addiction and all the nightmares that go with it. I loved Harvey, the masked man who was willing to go to any lengths to help get rid of the prophet and his henchmen. The inclusion of Dr. Diana Navarro into the story was quite excellent on the author’s part as she is a tenured professor in the Astronomy Department of Arizona State. Her published book about human spirituality and science explains a lot about what is going on with Brennan. 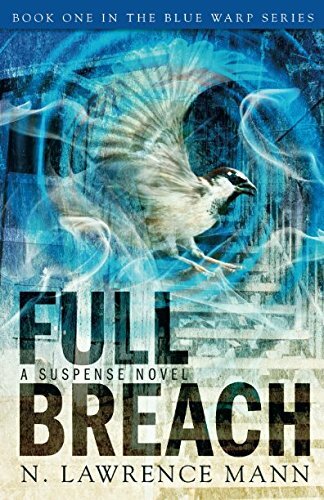 I thoroughly enjoyed reading “Full Breach” by N. Lawrence Mann, as it was engrossing from the first page to the very last. It gives one the best of all great components in a suspense novel. I look forward to reading more in the author’s Blue Warp Series.